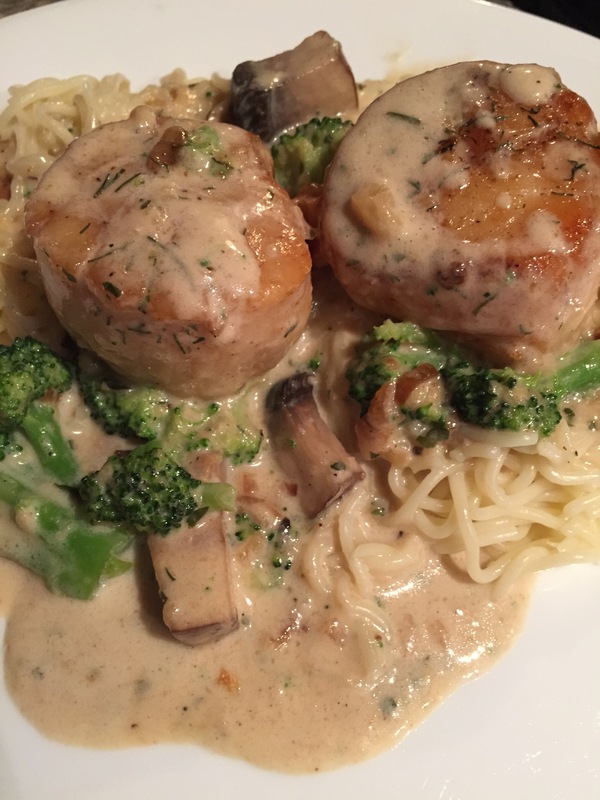 Last week I decided to delve into the sumptuous world of white wine creme sauces and angel hair pasta. I’d seen a pin several weeks earlier and jumped at the idea of making diver scallops. Yum, right? I wanted to start this blog year by sharing this amazing recipe, which I pieced together on my own, from a Pinterest dream. Here’s what you’ll need, to make 4 [awesome] servings. Less, if you’re feeling totally ravenous. 1/2 cup of White wine – pick a bottle of something you already love. Choose a slightly drier wine, for a stronger taste. I used a Pinot Grigio, standard – because I’m not a wine officionado of any kind, and the foodie at CM said this particular one would do the trick for my dish. Please do NOT use cooking sherry, unless, for some unholy kitchen reason, you love it. 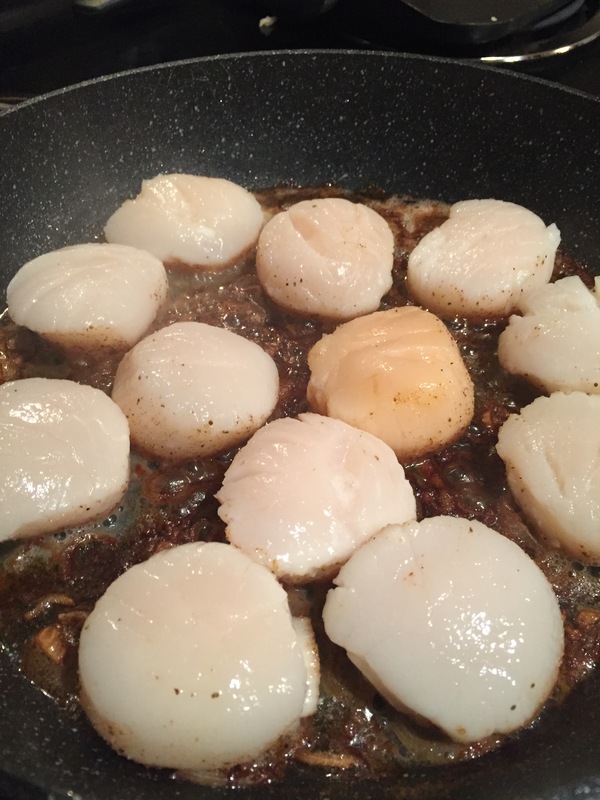 Diver scallops – 12 in total, at room temperature and patted dry with a paper towel! You can use more than 12, if you’d like of course. 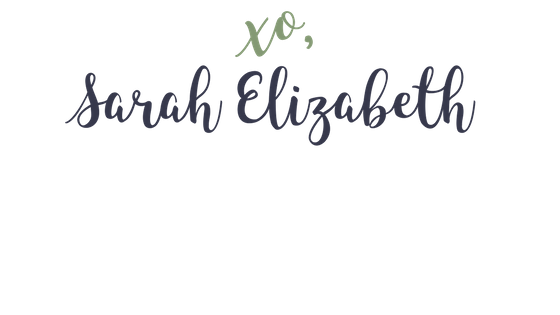 Old Bay Seasoning – Again, fairy dust for your main hoorah! 3/4 pound of Angel Hair Pasta, cooked to your liking. I strive for two minutes past al dente. 1. Take out a trusty pan, one that doesn’t cause you to scream out “Why did you murder my omelette? !” and grease that puppy up! By this I mean, add the Olive Oil and Butter. Heat the pan to medium heat. You can also begin to boil the water for your pasta at this time. Don’t forget to start your pasta! 4. 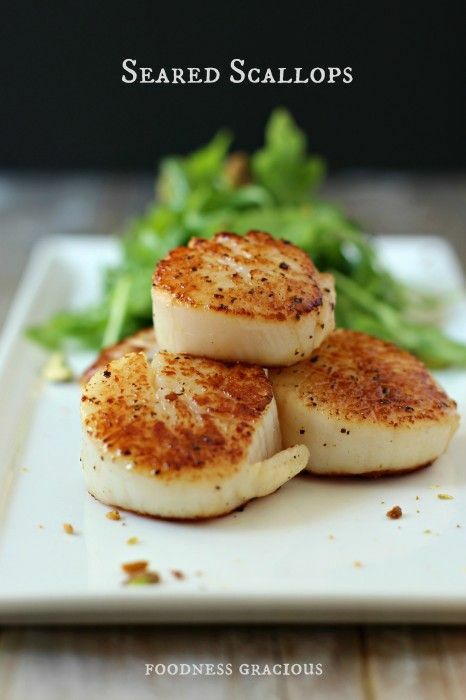 Get your scallops, Dust them with a shake (2 teaspoons split) of Dill, Old Bay, Salt and Pepper – On EACH side. I forgot to do the second side, so I quickly fixed them. 5. Place the scallops gently into the heated pan, and sear them for 5 minutes. Turn down the heat to medium low. Turn all the scallops over. Add in the white wine. Cover the pan for 5 minutes. 6. Remove the scallops and place them on a plate with a paper towel. 7. Slowly stir in the heavy whipping cream. 8. Add the Wondra. If you want a thicker cream, add more until you reach your desired consistency. 9. 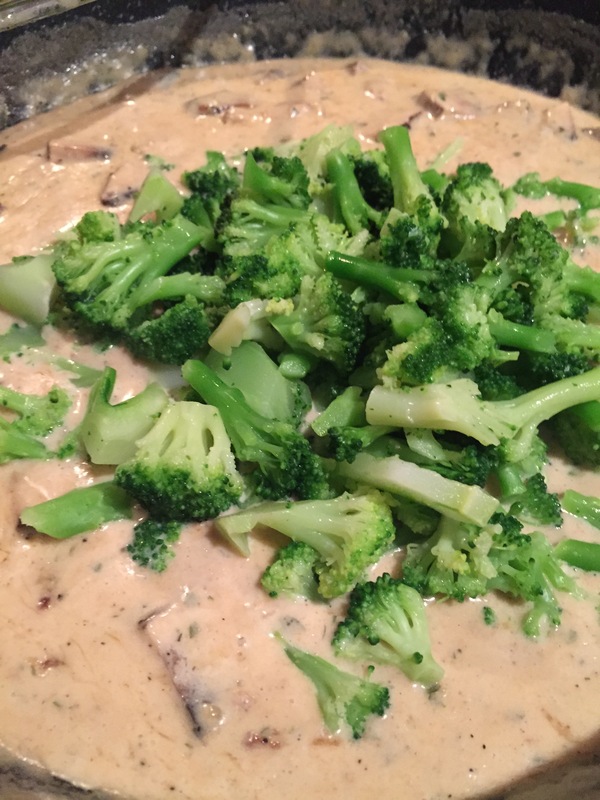 Add in the mushrooms and broccoli. Add salt and pepper, if need be. 10. Drain your pasta, as it should have been cooking during this time. 11. Add the scallops to your white wine butter sauce. 12. 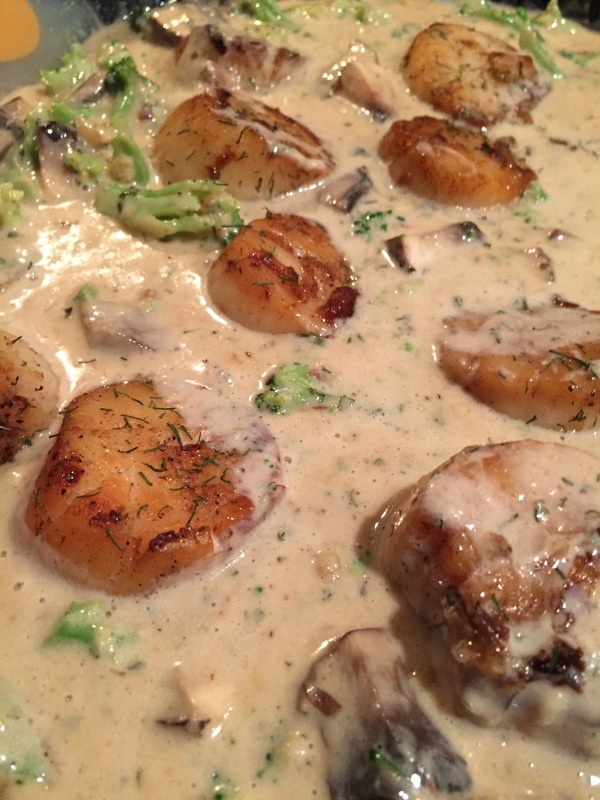 Place a bed of pasta on your plate, add three scallops and the broccoli+mushroom dream sauce. Enjoy the NOMS! I hope you’re ringing in the New Year with something delicious. Oh my goodness. That looks delicious. I can’t wait to try it. Thanks!